LiebenLogistics is a proud partner of the Goedgedacht Trust, the brainchild of husband and wife team, Peter and Annie Templeton, which aims to address rural poverty by taking a truly long-term perspective. The trust’s founding mission is to establish a sustainable and replicable community development programme that offers children and youth from poor rural farm-worker families an opportunity to become active narrators of their own stories. Path Out of Poverty, Goedgedacht Trust’s flagship programme, was established in 1998. Called POP for short, this ambitious effort attempts to transform and heal marginalised rural communities by providing opportunities for young people to break out of the cycles of generational poverty. In 2003, Goedgedacht Trading was established, as a potential source of funding for Goedgedacht Trust. The company’s aim is to create local job opportunities through the harvesting and marketing of super high quality olive oil, in an area of 48% unemployment. Sakkie Liebenberg, the founder and CEO of LiebenGroup, was introduced to the Goedgedacht family a few years ago. At that time Sakkie donated a much-needed delivery vehicle. In 2018 the Goedgedacht folks again approached Sakkie for a vehicle that more specifically suits the needs of the Goedgedacht Trading operation. 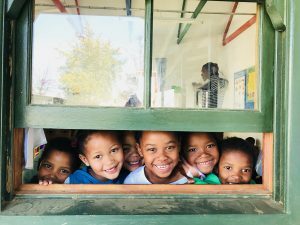 LiebenGroup happened to be evaluating the group’s own corporate social investment (CSI) initiatives, and a longer term partnership between LiebenGroup and Goedgedacht Trust was forged. LiebenGroup also participated in the celebration of Mandela Day 2018 at Goedgedacht Trust with the planting of three new oak trees in the courtyard of the youth development centre.